The Trokie is created from the finest California, sun-grown cannabis. It is organically grown without the use of any growth enhancers or pesticides. Trokie® edibles are pharmaceutical grade cannabis lozenges placed under the upper lip to maximize the absorption of all the medicine. Trokie products are designed to include the needs of sensitive patients with varying degrees of restrictions both medically and diet-wise. All Trokie products are sugar free, gluten free, have zero calories and are 100% vegan. With Trokie, it is an entirely different life – a life free of pain and fear! 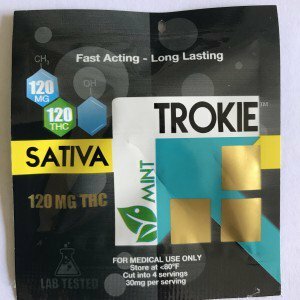 Trokie Edible Mint Drops Sativa offer long lasting, fast acting healing with full sativa effects. That’s not the only beautiful thing about this medicated candy. It gives a minty fresh breath and well oiled mouth, with a really nice feeling of well being you can sense almost immediately. The extract is decarboxylated at the perfect temperature and pressure allowing for better bioavailability of the THC and retention of the plant’s terpenes and flavonoids. Retention of the terpenes give cannabis its unique flavor and aromatic character. Terpenes and flavonoids also improve the efficacy of the cannabinoids and have many health benefits; lowering inflammation, improving immune function, and also serves as a muscle relaxant and analgesic. Place dose under your upper lip and try to limit the amount of saliva secreted to allow maximum absorption take place. The cannabinoids, terpenes, and flavonoids will cause some tingling in the throat when the medicine starts to work. Trokie® dissolves in 30-45 minutes and medicinal benefits begin to take effect within 5-30 minutes. The edibles are fast-acting due to its unique delivery system which is designed to have the medicine absorbed directly into the blood stream through the mucous membranes in the mouth, allowing for maximized bioavailability.